Shoulder pain is a very common complaint. Your shoulder is made up of several joints, tendons and muscles that allow a wide range of motion of the joint and whole arm. Because the shoulder is so complex, it is vulnerable to a variety of problems. The rotator cuff is a frequent source of pain in the shoulder. The head of the humerus fits into a socket (called the “Glenoid”) in the shoulder blade. A group of muscles and tendons keeps the shoulder centred in the shoulder socket. These muscles are called the rotator cuff. They cover the head of humerus and attach it to your scapula. 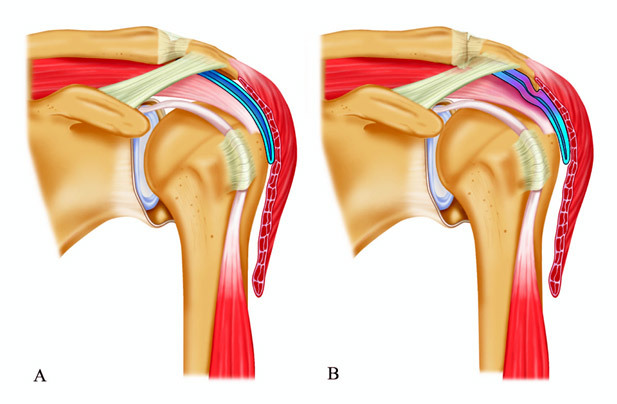 There is a lubricating sac called a bursa between the rotator cuff and the bone on top of your shoulder (acromion). This bursa allows the rotator cuff tendons to move freely when you move your arm in all directions. Tendinitis/inflammation: The rotator cuff tendons can be damaged or irritated. 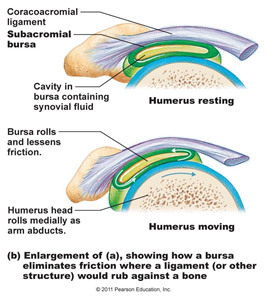 Bursitis: The bursa may become inflamed and swell with more fluid causing pain. Impingement: When you raise your arm to shoulder height, the space between the rotator cuff and acromion decreases, This causes rubbing (“impingement”) between the tendon and the bursa, leading to irritation and pain. Rotator cuff pain is common in both young athletes and middle-aged people. People who use their arms overhead for tennis, swimming and other overhead sports are particularly vulnerable. Those who do repetitive lifting or overhead activities/work using the arm (such as construction or painting) are also susceptible. Pain may also develop as the result of a minor injury. Sometimes, it occurs with no apparent cause. 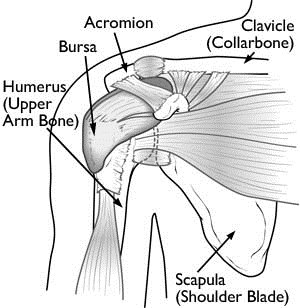 There is a lubricating sac called a bursa between the rotator cuff and the bone on top of your shoulder (acromion). The bursa allows the rotator cuff tendons to glide freely when you move your arm. 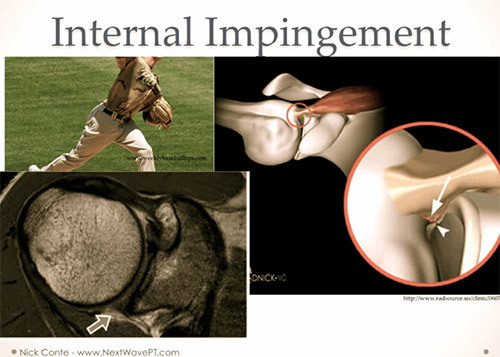 The word impingement basically means ‘rubbing’ or ‘catching’ of structures. In this context, we refer to structures within the shoulder. It is the impingement of the rotator cuff against other structures within the shoulder which form the basis of impingement syndromes. External impingement (also known as Subacromial Impingement) is where the rotator cuff is impinged in a part of the shoulder known as the sub-acromial space (as discussed previously). 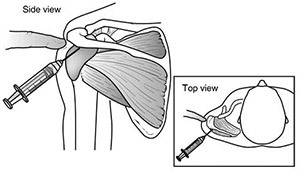 Internal impingement involves other structures within the main shoulder joint itself (Glenohumeral joint). The four muscles (and their tendons) that raise and lower the arm are collectively known as the rotator cuff. The rotator cuff lies under the roof of the shoulder (an extension of the shoulder blade known as the acromion). 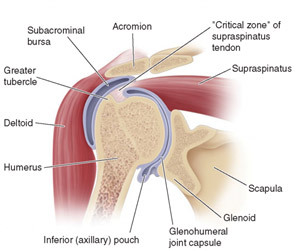 The space between the acromion and the rotator cuff tendons is filled by the subacromial bursa (a fluid filled sac that allows for smooth gliding of the rotator cuff under the acromion with all overhead movements of the shoulder). Chronic overuse leading to wear and tear of the rotator cuff tendons (tendinopathy). Abnormal muscle patterns of the shoulder. The acromion has different anatomic shapes in different people. 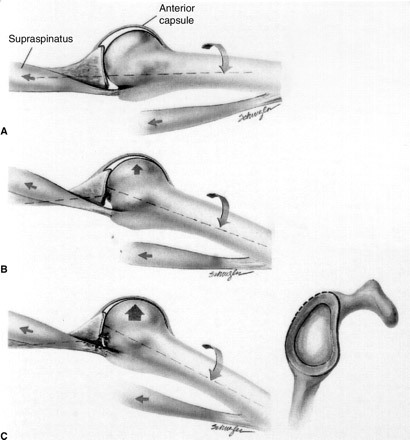 Some of these shapes may lead to narrowing of the acromio-humeral gap and bursal space. 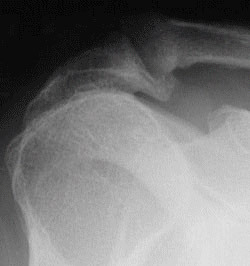 With advancing age people tend to develop a bone spur on the front and side of the acromion. This further reduces the subacromial space increasing the risk of impingement. Different scenarios: Somebody with a rotator cuff injury who has a type III acromion and is their 50’s has a very high risk of developing significant impingement compared to a patient in their 20’s sustaining a supraspinatus strain who may have a type I acromion and no spurs. The rotator cuff and acromion will then rub against one another, causing a painful condition known as impingement. Each time the arm is raised there is a bit of rubbing on the tendons and the bursa, which may cause pain and inflammation. Impingement may become a serious problem for some people and disturb their normal activities. This is when treatment is needed. If the pain comes on suddenly, the shoulder may be severely tender. All movement may be limited and painful. After discussing your medical history and symptoms, your doctor will examine your shoulder. He will check to see whether it is tender in any area or whether there is a deformity. To measure the range of motion of your shoulder and arm strength, your doctor will have you move your arm in several different directions and do several specific tests. Your doctor will also examine your neck to make sure that the pain is not coming from a "pinched nerve" and to rule out other conditions, such as arthritis. 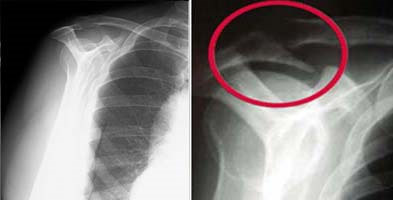 X-rays: X-rays shows the bones of the shoulder but do not show the soft tissues of your shoulder like the rotator cuff. X-rays of a shoulder with rotator cuff pain are usually normal or may show a small bone spur. 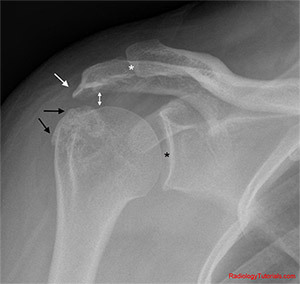 A special x-ray view, called an “outlet view”, sometimes will show a small bone spur on the front edge of the acromion. These studies create better images of soft tissues like the rotator cuff tendons, ligaments and muscles. They can show fluid or inflammation in the bursa and rotator cuff. In some cases a partial tear of the rotator cuff may be seen. The goal of treatment is to reduce pain and restore function. In planning your treatment, your doctor will consider several factors including your age, activity level, and general health. Rest: Your doctor may suggest rest and activity modification. Medication: Non-steroidal anti-inflammatory medicines (like ibuprofen and naproxen) and paracetamol-based tablets will reduce pain and swelling. Physiotherapy: A physiotherapist will focus on restoring normal motion to your shoulder. Stretching exercises to improve range of motion are very helpful. Once your pain is improving, your therapist can start you on a strengthening program for the rotator cuff muscles. Steroid injection: If rest, medications, and physiotherapy do not relieve your pain, an injection of a local anaesthetic and cortisone in the shoulder may be helpful. Cortisone is a very effective anti-inflammatory medicine. 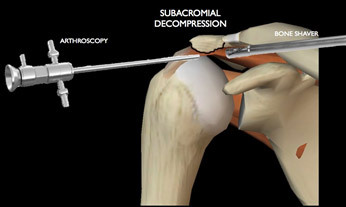 Injecting it into the bursa below the acromion can relieve pain. When nonsurgical treatment does not relieve pain, your doctor may recommend surgery. The goal of surgery is to create more space for the rotator cuff. Your doctor will remove the inflamed portion of the bursa and perform an anterior acromioplasty (part of the acromion is removed). This is also known as a subacromial decompression. 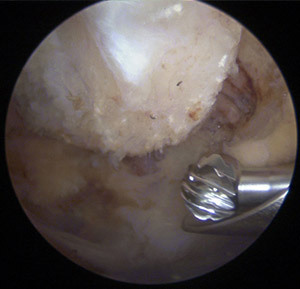 This procedure is done arthroscopically (keyhole surgery). Thin surgical instruments are inserted into 3 or 4 small puncture wounds around your shoulder. 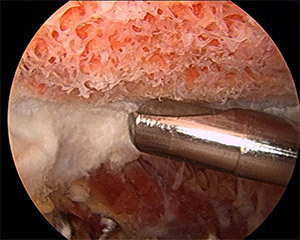 Your doctor examines your shoulder through a fiber-optic scope connected to a television camera. The surgeon guides the small instruments using a video monitor, and removes bone and soft tissue. In most cases, the front edge of the acromion is removed (acromioplasty) along with some of the bursal tissue (bursectomy). Rehabilitation: After surgery, your arm will be placed in a sling for a short period of time (if no rotator cuff repair was necessary). This allows for early healing and movement. As soon as your comfort allows, you may remove the sling to begin exercise and use of the arm. Your doctor will provide a rehabilitation program (guided by a specific physiotherapist) based on your needs and the findings at surgery. This will include exercises to regain range of motion of the shoulder and strengthen the arm. It typically takes three to six months to achieve complete relief of pain, but it may take up to a year. The condition is mainly seen in athletes, where overhead activity is a major part of their sport, particularly throwing athletes. In-fact, the condition is sometimes called “The Throwers Shoulder” and is also seen in the “Swimmer’s Shoulder”. It is for this reason that it is mainly seen in a younger athletic population. 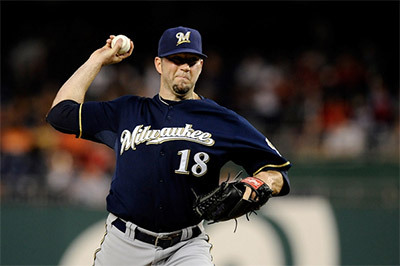 This picture shows how all of the components of the shoulder come together during throwing. The main symptom usually complain of is pain. This is made worse by over-head activity or throwing. There may also be shoulder instability as a result of the damage done to the labrum. The damage done to the rotator cuff may cause a weakness in the movements of the shoulder. Internal impingement is usually diagnosed on clinical examination. 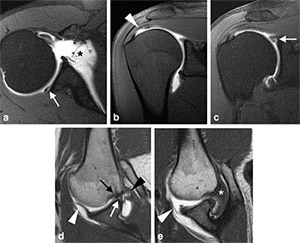 Special tests such as a MR-arthrogram (MRI with contrast injected in the shoulder) may be useful. Similar things may also be picked up on an ultrasound scan. Rest: This allows inflammation in the tendons, joint capsule and bursa to subside. NSAIDS (non-steroidal anti-inflammatory) and steroid injection: This will help to decrease the inflammation. Strengthening programme: Aimed at the rotator cuff muscles and other muscles of the shoulder and upper back. Sports / Job specific training: Rehabilitation aimed at a specific area of performance; in this case it is likely to be throwing. Surgery: Indicated if rest, medication and rehabilitation fail. This is aimed at repairing rotator cuff damage or labral damage. If the rotator cuff is badly damaged, repair must be considered.